Here it is. Our annual birthday tradition. 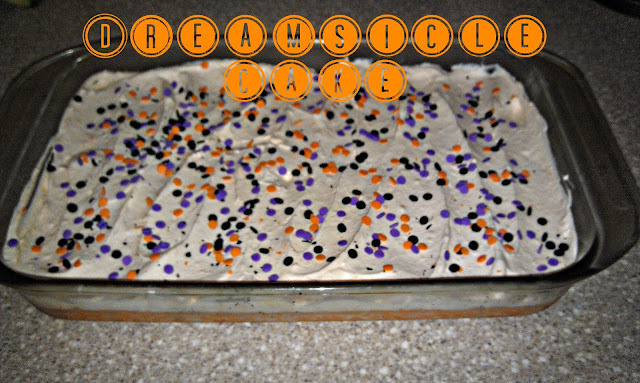 Alan's Dreamsicle Cake. It's just too yummy not to share! 10 oz Diet Sprite/Sierra Mist/7Up etc. Mix cake mix with diet soda and bake according to directions. Once the cake is out of the oven, poke holes all over it. Mix the box of orange gelatin with 1 cup of hot water, then mix in 1 cup of cold water. Pour over cake. Set in the fridge and chill for 3-4 hours or overnight. Combine gelatin and pudding mixes, then wisk in milk and vanilla. Fold in Cool Whip and frost cake. Decorate with sprinkles of your choice. I have made several variations of this cake, including lemon cake with lime jello and banana cake with strawberry jello, and my favorite is the orange version. So yummy! Please check out my friend Dara's giveaway here! It looks great and healthy too...score!